Best taxi rental services in gangtok sikkim. Gangtok is a municipality, the capital, the largest town of the Indian state of Sikkim and the headquarters of the East Sikkim district. It is located at an elevation of 5,410 ft and with town's population of 2,00,000 belongs to different ethnicities such as Nepali, Lepchas and Bhutia. It is a unique hill resort of northeast India and undoubtedly one of the oft-visited ones. 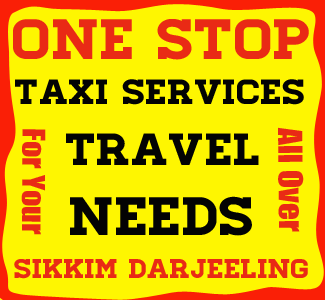 We are proven to be the best taxi service provide in Gangtok Sikkim. We provide - NJP to Gangtok Taxi service fare, Bagdogra to Gangtok taxi Services fare, Siliguri to Gangtok taxi services fare, Kalimpong to Gangtok taxi services fare, Pelling to Gangtok taxi services fare, Darjeeling to Gangtok taxi services fare, Gangtok cab rental servics, Taxi services for sightseeing at gangtok, Gangtok to Zuluk cab rental tariff, Gangtok to Darjeeling cab rental tariff, Gangtok to Kalimpong cab rental tariff, Gangtok to Pelling cab rental tariff, Gangtok to Siliguri cab rental tariff, Gangtok to NJP cab rental tariff. We also provide packege tour over Gangtok. Airpot : Bagdogra (130 kms from capital Gangtok) is the major airport of the region. Regular flights connects Bagdogra to major airports in the country. Rail Station : NJP (New Jalpaiguri) 125 kms from capital Gangtok is the major Rail Station. Road : Siliguri 115 km from capital Gangtok is the main junction and the largest town nearby the state. Entry points : There are two Major entry points for Sikkim. Rangpo : Tourists visiting East and North districts including capital Gangtok, enter into Sikkim through Rangpo. Melli : is the entry point for West and South districts. Indian : Indian tourists visiting sikkim do not require any permit to enter the state. However they require special permit created by Travel Agents in Sikkim, Goverment Authority to visit some of the 'Restricted Area' inlcuding Nathula Pass - Tsongo Lake & Baba Mandir – Zuluk – Memenchu area in East, entire North district (Lachung, Lachen, Yumthang valley, Gurudongmar Lake, Dzongu), Dzongri – Goechala area in West district etc. Restricted Area for Foreigners : Foreigners are strictly not allowed to visit Nathula Pass, Baba Mandir, Zuluk, Gurudongmar lake etc. Best time to visit sikkim is during the months of March, April, May, June, October, Nov. Most of the roads remains closed during the month of July, August due to heavy rainfall and landslides. Also some of the tourists don't prefer to visit Sikkim in the months of December, January and Febrary due to cold climates. Best taxi fare to Gangtok from Bagdogra, NJP, Siliguri, Darjeeling, Kalimpong, Pelling, Lachung, Lachen, Gurudongmar Lake, Yumthang valley, Yumesamdong - Zero Point, Katao, Zuluk, Changu Lake, Baba Mandir, Nathula Pass.